Thankfully, Sunday had a little more action as I did leave the house for yoga. That’s two weeks in a row…woo hoo! Sunday afternoon, a friend, her two kids, and I took a road trip about 2 hours south to visit another one of our college roommates and celebrate her baby shower. It was a great afternoon to be outside catching up with old friends and reliving good times. We left just as the sun was starting to set over the fields. Monday was a do over from Saturday. I could have spent another day inside, but instead went out for a run. Even though it rained most of last night (here, not where we were BBQing), it was still hot and humid today. I’ve been feeling a little slow and down on my training, so I was hoping to have a speedy and strong run. My legs (and abs) felt tired from yesterday’s yoga class, but despite a slow start, I was able to finish my 5 miles in 44:15 with a negative second half split. That was a great way to start the day. The BOY and I went out for lunch and then swung by the grocery store for the necessities. He has been talking about chili all weekend, so despite the heat, we decided to throw a batch into the crockpot for dinner. 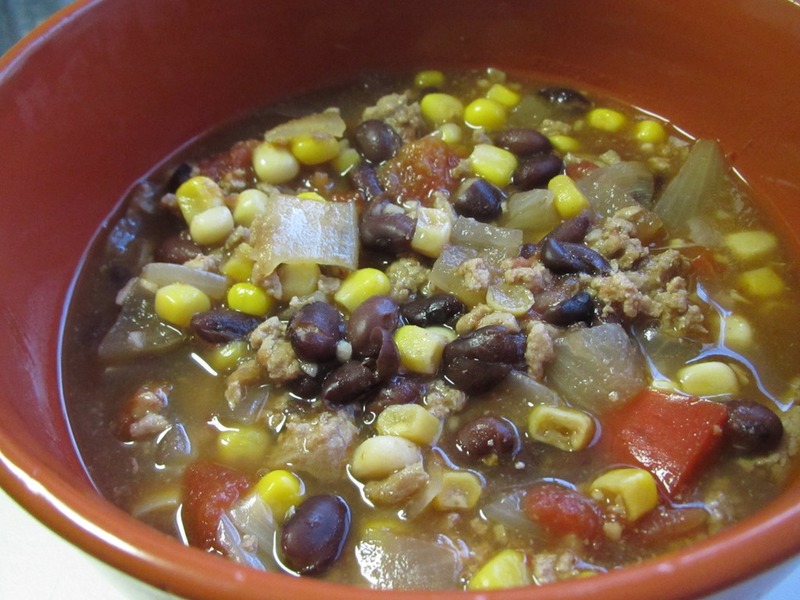 We are a little rusty on our technique, but pulled together a bold tasting Turkey, Black Bean, and Brew Chili based on this Vegetarian Times recipe. Just the smell of chili in the air brought a smile to my face! This wasn’t our favorite chili recipe, a little more watery than we typically like (I would recommend only using one bottle of beer), but it was extremely tasty with the dark ale! There will be plenty left over for lunch this week, which I am looking forward to! Sadly, the long weekend has come to an end, but fall is just around the corner! Hope you had a wonderful labor day weekend filled with adventures and down time! -Brown meat in skillet over medium heat. -Place meat in the bottom of crockpot sprayed with cooking spray. 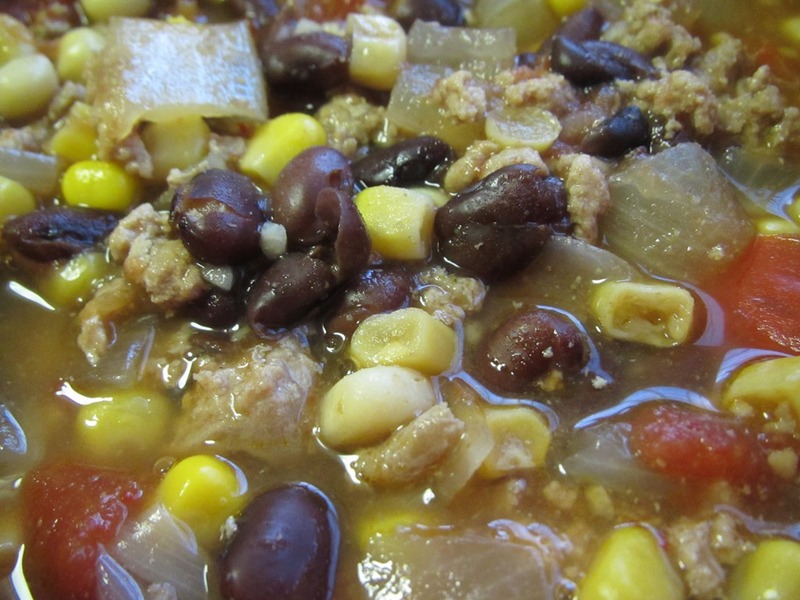 Add chilies, onion, red bell peppers, black beans, corn and tomatoes. -Stir in spices and beer. -Set crockpot per instructions 6-8 hours. What a lovely relaxing long weekend! Gorgeous sunset pics! And, nice work on the negative split run! Have a great week! Thanks Erin! Hope you are enjoying some down time as well. It was great to read about your awesome swim! Sounds like a great Saturday to me! Everyone needs a day off from life every now and then!! I am sure Cooper loved having you around all day. We spoiled him! I need another day off already!